» Rocket Nozzles Materials Research & Design, Inc.
Materials Research & Design, Inc. (MR&D) has extensive experience in the design and analysis of rocket nozzle throat inserts. MR&D has been part of various programs related to the development of high temperature rocket nozzle materials for over fifteen years. Specifically, MR&D has been on the Integrated High Payoff Rocket Propulsion Technology (IHPRPT) team for over five consecutive years. In that time, we have designed non-eroding metallic throat inserts made with pure tungsten, tungsten-rhenium alloys, and tungsten-rhenium alloys doped with hafnium carbide. These materials proved to be very successful through static motor firings which have been predicted through analytical results. Some of the more severe metallic throat firings have survived up to 20-second burn times with aluminized propellants that lead to stagnation temperatures in excess of 6000°F and stagnation pressures over 2000 psi. These conditions push the throat insert temperatures in excess of 5800°F. An example of the importance of the thermal-structural modeling that MR&D performs for ceramic rocket nozzle development is shown in Figures 1 through 3 below. In this project, MR&D designed and analyzed a variety of braid-reinforced CMC thrusters to replace the current metallic thrusters in a rocket motor nozzle throat. Figure 1 shows an example of the computed stress fields. This figure includes the radial, axial, hoop, and rz shear stresses. Typically, design decisions are based on the computed axial and hoop stresses because they tend to dominate the other stresses and failures are often a result of radial and axial cracks that resulting from these stresses. Figure 2 shows the computed safety margins for all of the cases analyzed. This resulted in the selection of the braid architecture and part thickness recommended for a static motor firing. 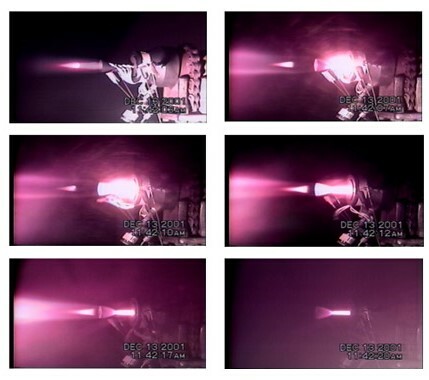 Figure 3 shows pictures of the successful static motor test firing. the computed radial (a), axial (b), hoop (c), and rz shear stresses (d). Calculated margins of safety for the computed axial (a) and hoop (b) stresses. resulting from MR&D design analysis. MR&D is also an active member of the IHPRPT Ceramic Boost Nozzle program. We have been involved in this program throughout its duration of two years. This program focuses on developing ultra-high temperature ceramic materials to survive in more severe thermal-structural and thermal-chemical rocket nozzle environments. To date we have designed the first four rocket nozzles that were successfully tested in the program. They all survived when subjected to an aluminized propellant with a stagnation temperature and pressure of over 6000°F. These motors employed a tantalum carbide throat material with an external rhenium or tantalum tungsten alloy metallic jacket. The fabrication processes included plasma spraying and hot isostatic processing (HIP).